It's Specter Off-Road's packaged diesel conversion solution. We look at Half-Cut vehicles as what you need for a diesel conversion. A Half-Cut is the front half of a vehicle cut just behind the rear output shaft of the Transfercase across the floorboard and through the windshield pillars. Why a 1/2 Cut? read more Read more. Also check out past Half-Cut Conversions on the next tab Conversion Examples. Available Now. Watch the video, hear it run. Call SOR for info (818) 882-1238. 1991 FJ80 with 1HDJ Single Overhead Cam Diesel Conversion. 5 speed manual transmission and transfer case. Part time 4-wheel drive. Features include: Non-USA Rims and Tires. Power Windows, Electric Door Locks, Sun Roof, Roof Rack, AM/FM Stereo, and A/C. No Factory Flares, No Factory Rear Sliding Windows, No Factory 3rd Row Seat. 1984 High Roofline FJ60 Converted to HJ60 using SOR Half-Cut. 5 speed manual transmission and transfer case. Part time 4-wheel drive. 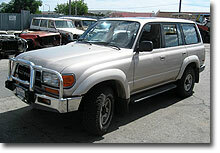 Features include: AM/FM Stereo with CD player, ARB Bull Bar, new battery, new spring bushings and A/C. Unique to the US with FACTORY features like, rear sliding windows, front door wing windows, 3rd row seat, high roof line, passenger side grab bar, running boards, rear step bumper and gold trim. No rear heater or rear window defrost. A diesel conversion is more than just a simple motor swap. It requires drive train conversion or adaptation, plumbing new cooling, heating and fuel systems and wiring new electrical systems. Also to be considered is the voltage rating of the electrical system for the target vehicle, 12 or 24 volt. A 1/2 cut minimizes the need to reengineer those systems. It's a factory assembly ready to be transplanted into your chassis. Generally they include the engine with accessories, all the wiring found under the hood, the transmission and transfercase, instrument cluster, inner fender wells and front leaf springs. But because they are from different models, the accessories may vary. 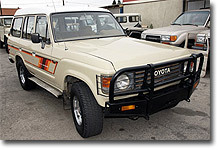 The assembly is out of a right hand drive vehicle, you will need to fabricate power steering lines, air conditioning refrigerant lines and splice connections to the main wire loom. They do not include the axle assemblies. The neat part is they are 12 volt electrical systems so you don't have to change the rest of the vehicle to 24 volt. 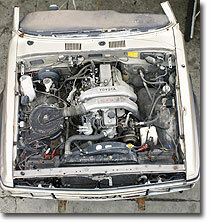 You will need to check your local vehicle laws concerning engine conversions. 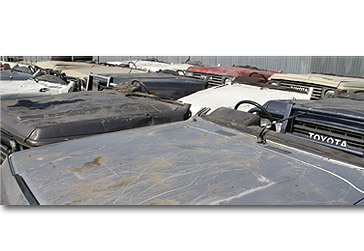 If you have any questions whether a half cut will fit your conversion needs, call the Specter Off-Road. 1/2 Cuts must be shipped by truck. 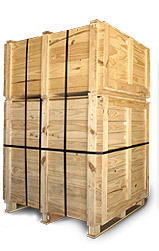 For freight estimates call the SOR sales staff at (818) 882-1238. 8/80-8/87 60 Series - Price shown is club price for will call pick up - Truck freight charges, crate fees and surgical extraction from the chassis are additional charges. 8/87-1/90 62 Series - Price shown is club price for will call pick up - Truck freight charges, crate fees and surgical extraction from the chassis are additional charges. 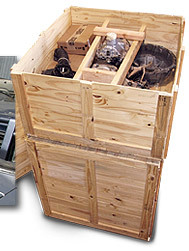 Price shown is club price for will call pick up - Truck freight charges, crate fees and surgical extraction from the chassis are additional charges.